We would continue our journey from Anayirakal(Anayirangal) dam.If you have missed the first five days of this itinerary, you can find it here. Anayirakal dam is located at 28km from Munnar on the way to Thekkady. 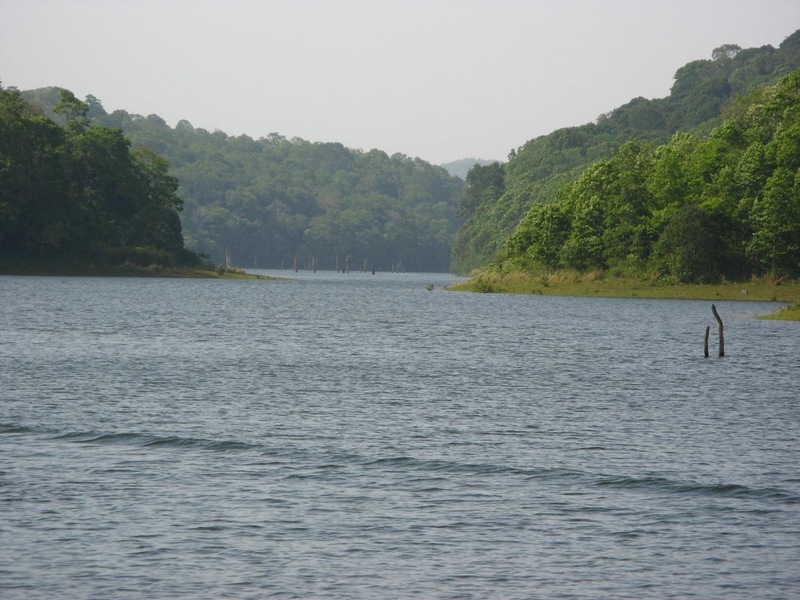 Anayirankal dam is spread across the tea plantation and ever green forests. There are many small islands in the water; some of them only emerge during the summer season. There is a fairly good road reaching till the dam site. One can reach near the banks of the dam through small trails in the tea plantation. This are is particularly picturesque with the clear water, green islands and the Western Ghats standing as a fort around this artificial lake. 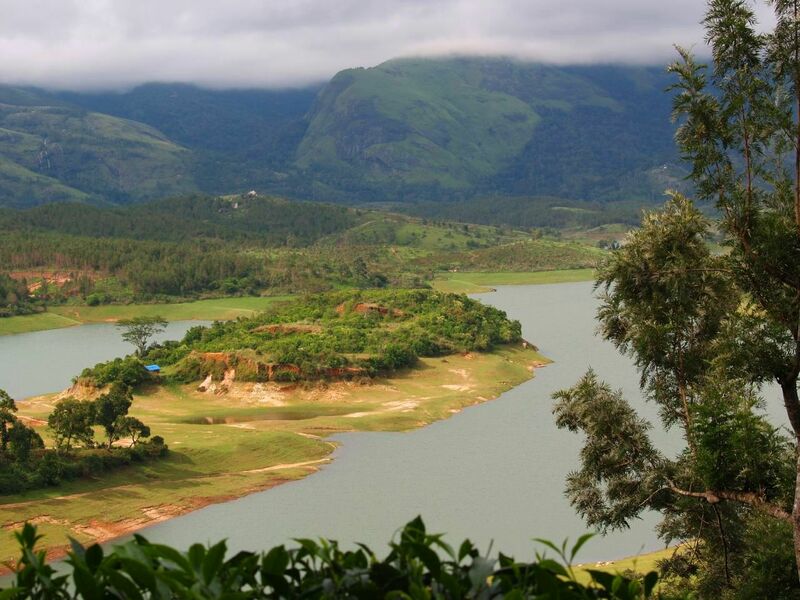 Ramakkalmedu is a hill station around 55km from the Anayirangal dam, on the Munnar-Thekkady road. Ramakkalmedu offers a breathtaking view of the Theni and Kambam villages of Tamil Nadu villages. The name of this hill has come from Rama-Kal-Medu (Land where lord Rama kept his leg). Wind blows at a speed around 35 km per hour at Ramakkalmedu throughout the year irrespective of the season and time. by Aml jhn - Own work. Licensed under CC BY-SA 3.0 via Wikimedia Commons. 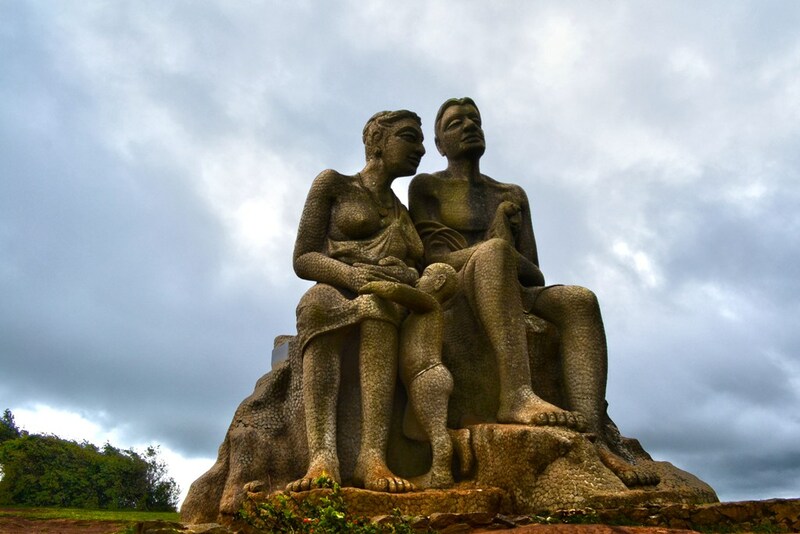 There is a huge statue of the “Kuravan and Kurathi” who has a significant legend related to the construction of Idukki arch dam too. 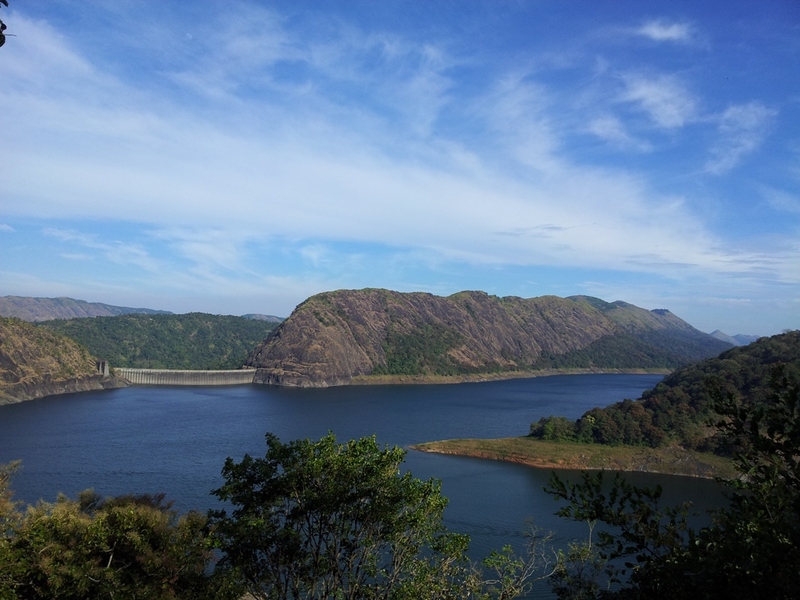 The mountains between which the Idukki dam is constructed are also named after them. According to the legend, Kuravan and Kurathi helped the authorities to find the right place for constructing the dam. "Koravankorvatti" by Balachand - Own work. Licensed under CC BY-SA 3.0 via Wikimedia Commons. If you climb up again(around 30 minutes trek), you can reach the vantage point of Ramakkalmedu. A word of caution will climbing up, one must be extremely careful about the slippery rocks; especially if it is raining. Ascend is also needs to be done with due care. by Sibyperiyar - Own work. Licensed under CC BY-SA 3.0 via Wikimedia Commons. The primary attraction of Thekkady is the famous Periyar Wild Reserve located at the banks of the Periyar Lake. It is an artificial lake formed by the Mullaperiyar dam across the Periyar river. by Yohannvt - Own work. Licensed under CC BY-SA 4.0 via Wikimedia Commons. The banks of this lake have thick grass lands, where elephants, sambar, Nilgiri Langurs, bisons and occasionally tigers could be spotted. Sanctuary can be accessed through a trekking, boating or jeep safari. It is best to reach this spot as early as possible. by Rameshng at ml.wikipedia. Licensed under CC BY 3.0 via Wikimedia Commons. The ticket cost is INR 150 for Indian nationals. You can save time by booking tickets online here. There are only 5 trips of boating per day which is of duration 90 minutes. (7:30am, 9:30am, 11.15am, 1.45pm, 3.30pm). In case if you couldn’t book the boating tickets online, then you need to reach at least 2 hours prior to the destined departure. Kerala tourism department also arranges full day bamboo rafting sessions which includes 3 hours rafting and 5 hours of wildlife trekking. Half day bamboo rafting package is also available. There are a lot of other packages offered by tourism department as part of “community based Eco tourism programs”. Nature walk, Jungle walk, Green Walk, Bamboo rafting, tiger trail, stay in Bamboo tree houses are some of them. I found this blog has a lot of information on the same. 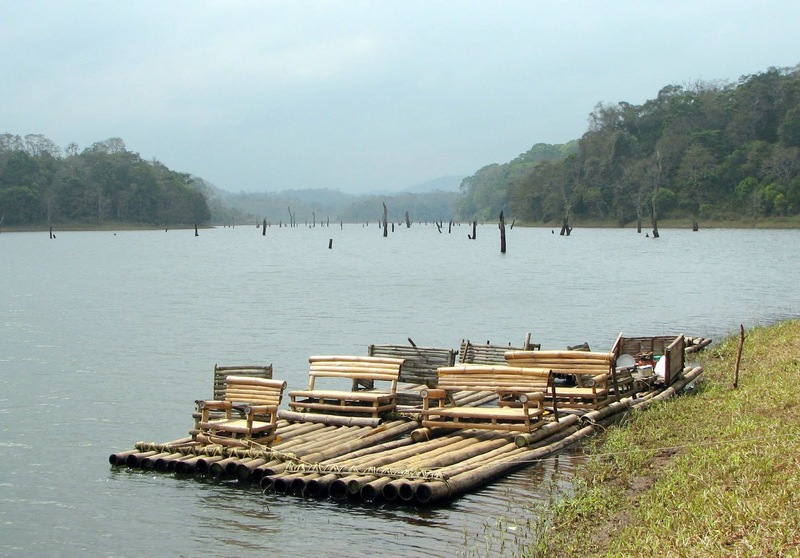 Note: This itinerary is on the assumption that the boating tickets are booked online, and if you have not, then you need to reach the periyar wild reserve at least 2hours prior to your planned boating time. As the first boating schedule has the maximum chance of spotting wild animals, I am choosing it. Also, it allows to have the afternoon free for other activities. 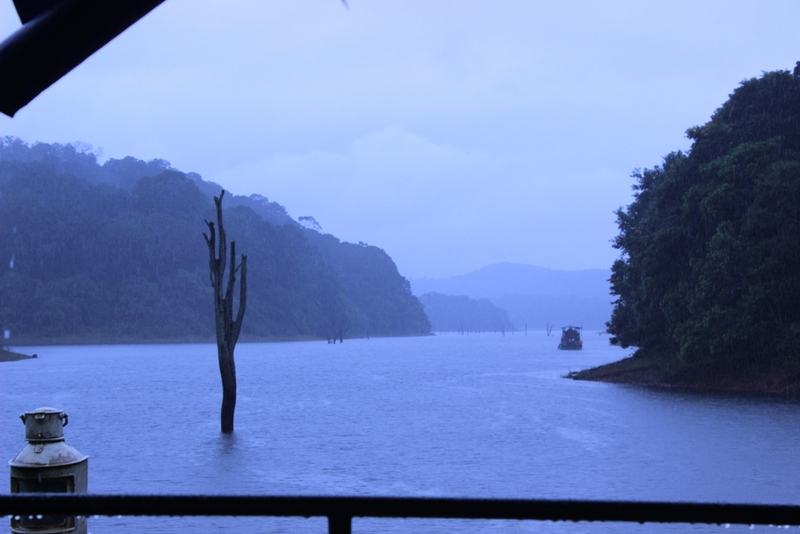 7:30am - 9:00 - Boating through the Periyar lake ; make sure you stay quiet as noise would drive away the animals. 9:30-10:00 - Breakfast at one of the restaurants in the reserve. Peermade is a small hill town between Tekkady and Vagamon. It is famous for the tea plantations and factories. 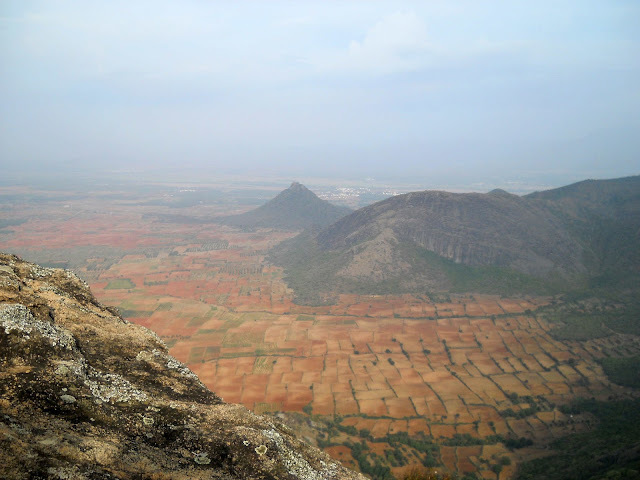 There are many hill around Peerumade, which are ideal for short treks. Peermade is blessed with fertile soil and beautiful valleys of the tea plantations. One of the main attractions in the Peerumade town is the St.Mary’s Church Pattumala, which is situated on a small hill at a mere 2.5 km from the Peerumade town. This Gothic style church standing in midst of the tea plantation is a picturesque view. Parunthumpara a famous hill station is located 7.5km from the Pattumala church. “Parunth” in Malayalam is eagle and Parunthumpara refers to “Eagle rock”. 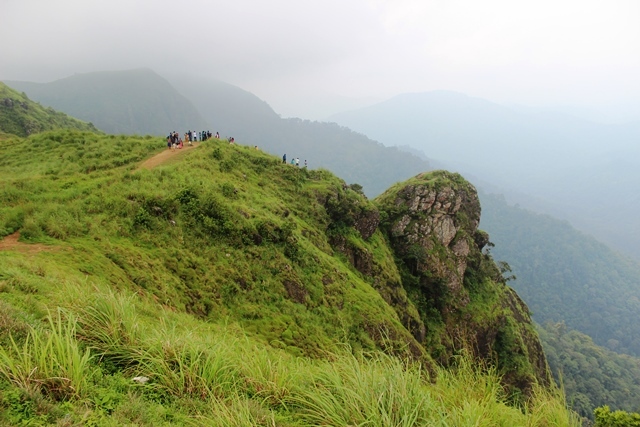 This pinnacle located around 6km from Peermede and 25km Thekkady has obtained its name from the bird’s eye view it offers from the top. Recent years there is an influx of tourists to this scenic place. "Parunthumpara 12" by Praveenp - Own work. Licensed under CC BY-SA 4.0 via Wikimedia Commons. The route to the pinnacle is quite sloppy and as a word of caution, one must be very careful while descending as well as ascending. 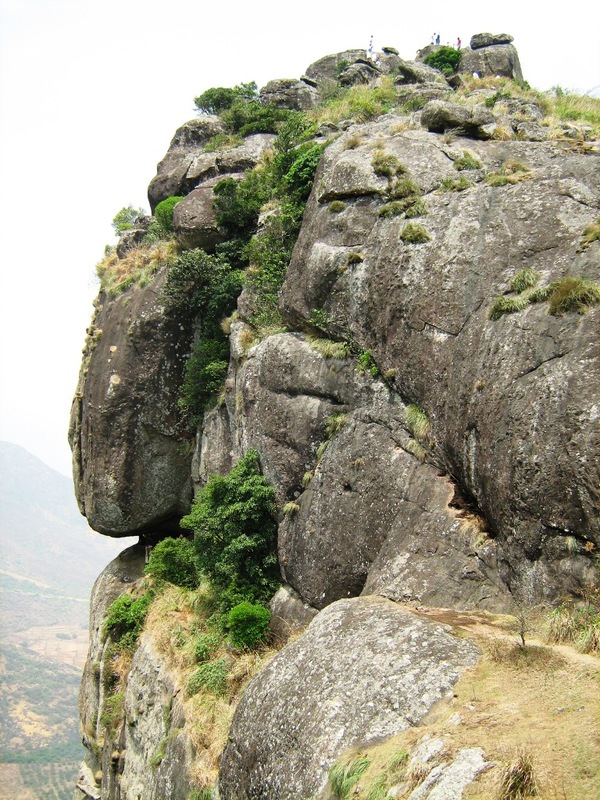 There is good connectivity till the foot of the rock, from there is a footpath leading to the higher part. If you want to go to the pinnacle then, you need to do a little bit of rock climbing. 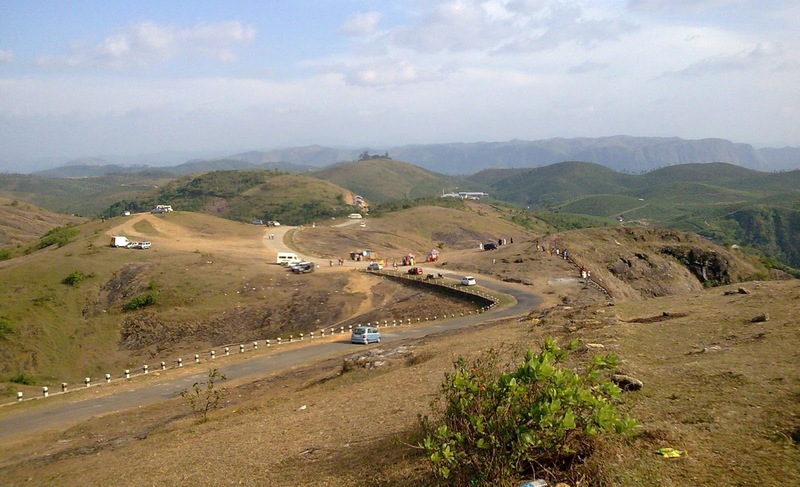 There is a scenic route from Parunthumpara via Elappara to reach Vagamon. 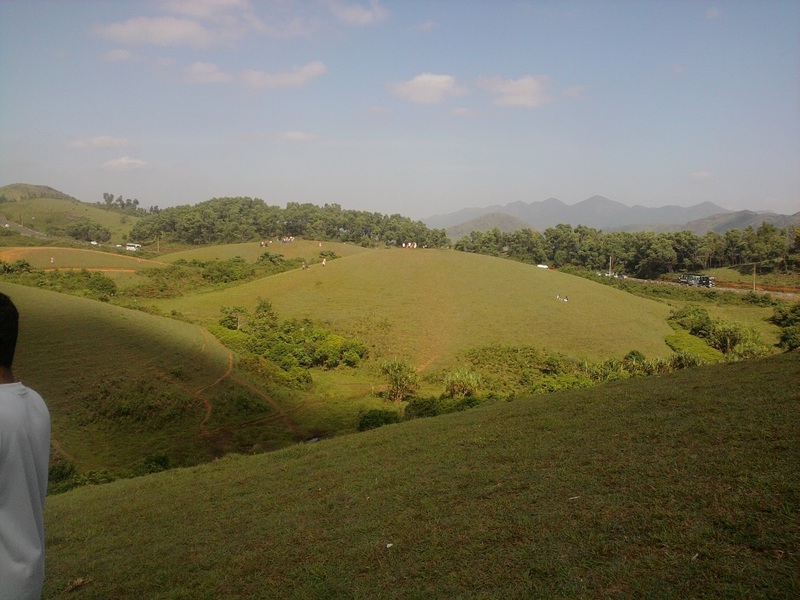 Panchalimedu is a green valley, accessible after a short trek. The main attractions of this location is the scenic view of the valley with crosses in one side and on the other side there is an ancient pool. There is a legend associated with Panchalimedu. As the name suggests, when the "Pancha Pandava " along with their wife Panchali(Draupathi) (from Mahabharata) was in exile, they have said to be here in Panchalimedu. The trek towards the peak wouldn’t take more than half an hour, however one should be careful to do this trek while there is enough light and the descent must be careful. Vagamon is a small town which is located at 33km from Parunthumpara. Situated at 1,100 meters from the sea level, Vagamon is a scenic place with its tea plantations, green meadows and pine forest. There is almost always fog and temperature can be as low as 10degree Celsius even in the summer days. There are many attractions in and around Vagamon. by Alan 2988 - Own work. Licensed under CC BY-SA 3.0 via Wikimedia Commons. 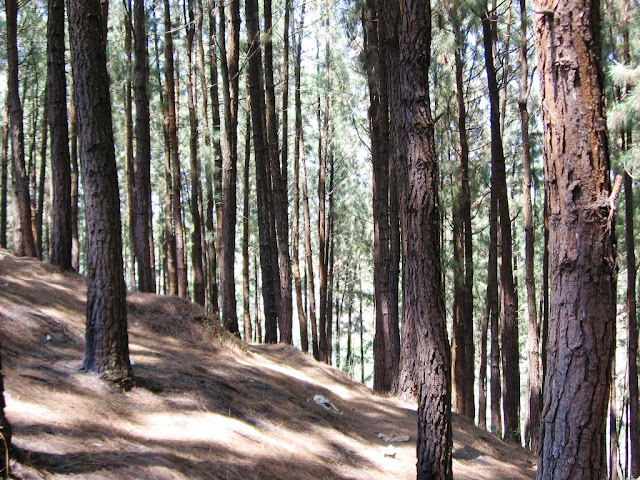 The pine valley is located at Kolahalamedu, 6km from the center of the Vagamon town. 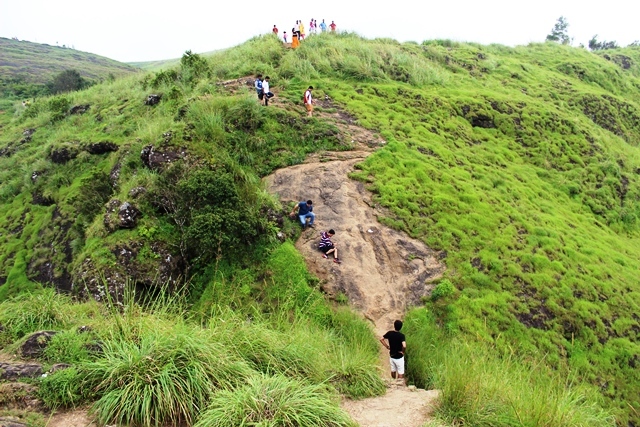 Another tourist attraction is the vast green meadows of Vagamon. There is also a lake amidst of this grass turf, which make an ideal location for picnic and photo shoots. "Pine trees at vagamon Kerala"
Ilaveezhapoonchira is located at 50km from Vagamon. 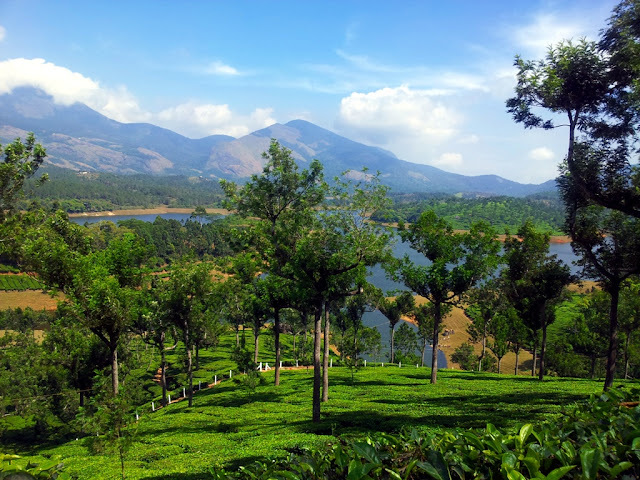 It is hill station located in the "Kudayathoor Vidyan" mountain range. Ilaveezhapoonchira also has a legend associated with its name. In Mayalayam Ila-Veezha-Poochira means a lake where no leaves falls. 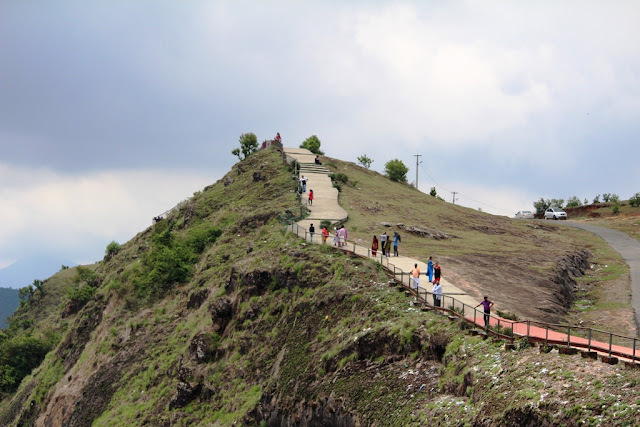 The legend says that the five Pandava brothers of Mahabharata during their exile camped on this hill. There was a lake on top of the hill, which has slightly hotter water than the other places. They covered this lake with the Ilavu flowers, so that their wife Draupathi can take a bath in the lake. The wind blows in such a way that leaves from the nearby trees doesn't fall into this lake. However, there is no lake on top of the hill today, there is just a swamp and a small stream originating from there. to the top point of Ilaveezhapoonchira, there is 9km from the main road. This stretch partially can be covered by car or bike (around 5-7km). The rest of the stretch can either be covered by hired Jeep(but one has to hire from the main road itself) or by foot. It is an hour's walk to the top. Even though there is no lake as the name suggests, the view of the Malankara dam reservoir from the top of the hill is superb. We can see the entire dam and the surrounding hills from the view point. There is a guest house of tourism department on the top of the hill. One need to carry enough water and food as there are no shops nearby. For those who are more adventurous, there is a "Muni Guha", the megalithic tombs, that can be spotted if you descend around 2km from top. However, this needs to be done with proper consultation with the officers in the tourism guest house at the top. 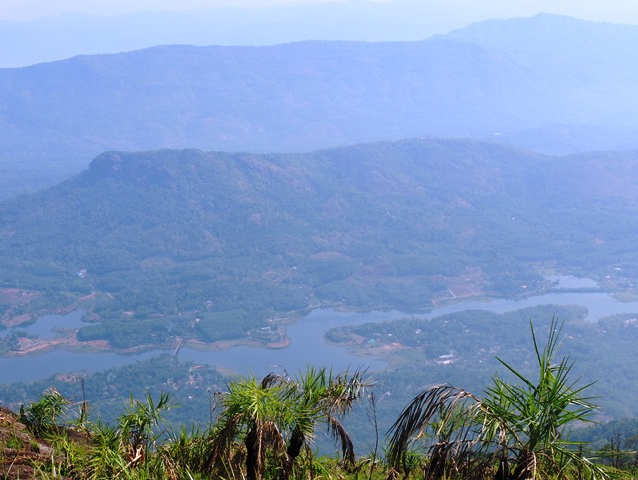 Anchuruli is a scenic picnic sport on the banks of the Idukki dam reservoir. 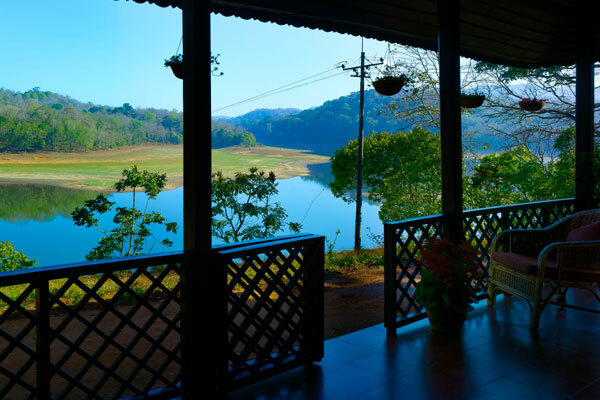 From Anchuruli one can have a nice view of the Western Ghats, the beautiful grass lands and the idukki reservoir. There is also a 5km tunnel through the hill which brings water from Erattayar to the idukki dam reservoir. During the monsoon season, small waterfalls form near this area. Anchuruli is perfect for a short picnic of one or two hours. It has an added advantage of right in the route to the Idukki dam. Idukki dam is Asia’s first arch dam, which is built across the “Kuravan” and “Kurathi” hills. 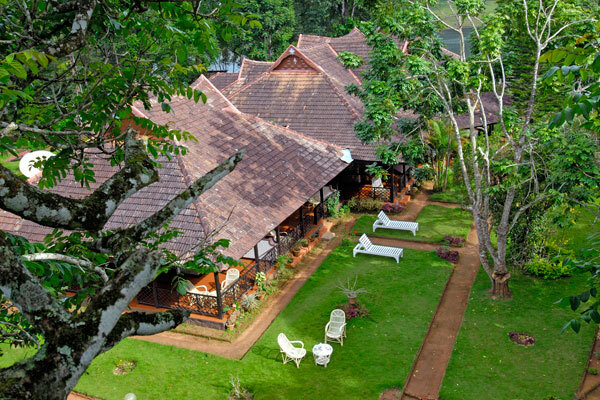 It is located around 6km from Painavu, the head quarters of Idukki district. The huge parabolic arch dam is built across the Periyar River. The primary function of the dam is generation of hydro electric power; however the Idukki dam site is a beautiful place to visit. by Rameshng - Own work. Licensed under CC BY-SA 3.0 via Wikimedia Commons. 4:00 pm : Start from Idukki dam. 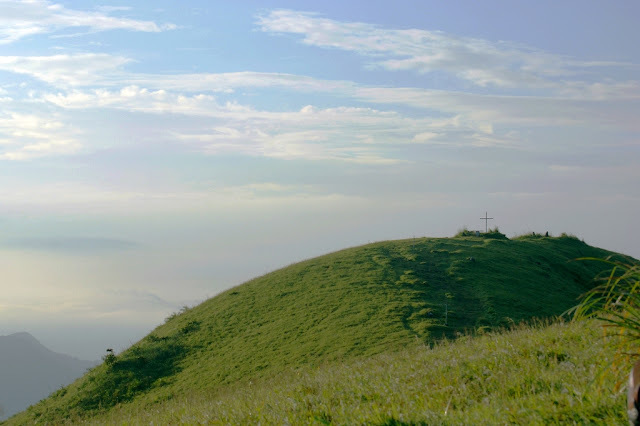 Nice places!Vagamon is a beautiful tourist place to visit with lovable ones. Oh Wow! This is the same place my friends have visited last week. They sent me the pics and then I decided I would be there once in my lifetime. What beautiful photos! I didn’t know about how they made those book designs, stunning! Thanks for sharing. Superb post with stunning pictures! These are actually most beautiful places to visit in Kerala.